If you’ve ever driven past Hasselt on the highway linking Luik and Antwerp, you might have noticed a group of stately brick buildings with an imposing gatehouse and ornate corner tower on the outskirts of town. Whizzing by at 120 kilometers an hour, you might not have realized that you’d glimpsed what was once the most important nunnery in the Low Countries and a center of economic and political power in the region. 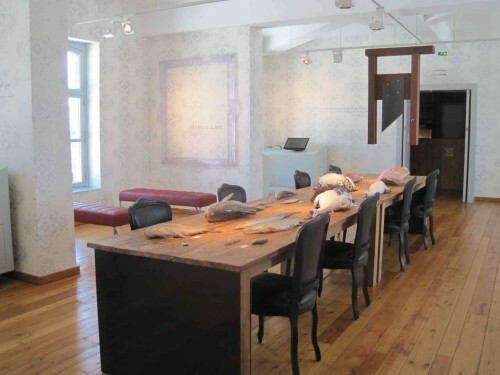 The former Abbey of Herkenrode, a Flemish Heritage Site, is home to a new Experience Center, combining elements of a visitor’s center and museum, where you can learn about the history of this beautiful monument. 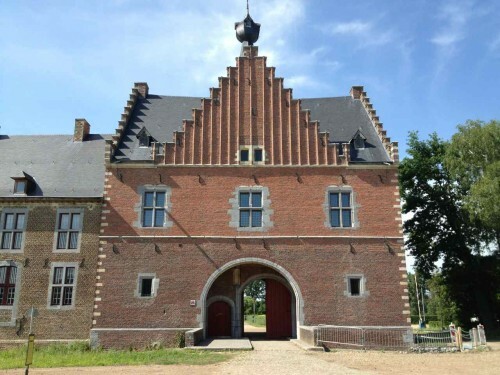 The entire site has been under restoration since 1998, and the Experience Center is only the latest chapter in the continuing history of Herkenrode. Admission to the Center includes an audio guide, available in four languages including English. The audio tour is triggered by electronic sensors throughout the exhibit, so you can go at your own pace and choose which parts to listen to. All of the wall texts are likewise translated into English, French and German as well as Dutch. The theme of the exhibition is “A Journey Through Time,” and the rooms are arranged chronologically, from the violence and piety of the Middle Ages to the luxury and privilege of later centuries. Everything is impressively state-of-the-art, with touchscreen displays that allow you to explore topics in depth, and video screens showing dramatic reenactments of different episodes in the abbey’s history. The exhibits sometimes resemble installation art rather than museum displays, lending the experience an unexpected touch of surrealism. For instance, one kiosk, dedicated to a miraculous event that occurred in 1317, is ringed with video screens depicting a communion wafer that starts to bleed before your eyes. Another room features a long table on which the carcasses of fish and game eaten at the abbey have been carefully arranged. Upon first entering the Experience Center from the bright, modern lobby, let your eyes adjust to the dimly lit room beyond. Don’t be surprised to see a life-size statue of a unicorn, the symbol of Herkenrode, or the silent figures of two nuns sitting on the benches to your left. Here you can watch a film that wordlessly gives an overview of the different time periods and introduces some of the historical figures you will encounter in the rooms ahead. Founded in 1179 by the Count of Loon as a burial place for himself and his descendents, the abbey became a Cistercian nunnery in 1217. At that time, the Cistercian order was at the height of its power and influence, rapidly expanding throughout Europe. During a period when women enjoyed few rights, religious establishments such as Herkenrode afforded women a degree of independence, safety and autonomy that their secular sisters rarely experienced. The role of women at Herkenrode is a primary focus of the exhibition. The audio narration is told from the point of view of various abbesses over the centuries. At each point in the historical timeline, an abbess relates the events of her day in a fictionalized script that brings the past to life. One room tells the story of Elizabeth of Spalbeek, a local mystic who helped ensure the abbey’s fame. The fortunes of Herkenrode rose and fell over the centuries, due to religious wars, political feuds and sometimes even famine and disease. The mid-sixteenth century was a period of great prosperity for the abbey, thanks to the support of the Prince-Bishop of Luik. This was Herkenrode’s “Golden Age,” when the abbess commissioned great works of art to adorn the abbey’s church and other buildings. Most of these treasures were lost when the abbey was closed and its contents sold in 1797. 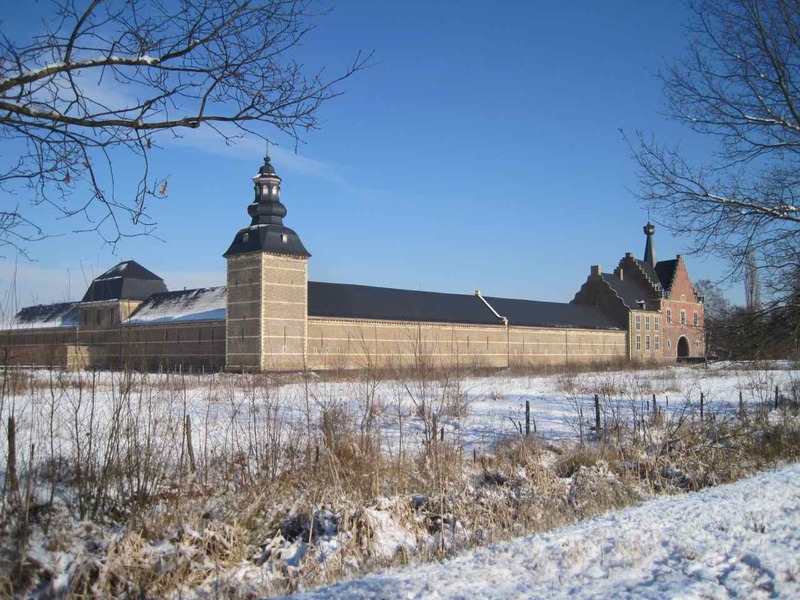 The French occupation put an end to 600 years of religious life at Herkenrode. During the nineteenth century, the abbey was used to house textile and sugar factories. In 1826, a fire destroyed many of the buildings, including the abbey church. Eventually, the remaining structures fell into disuse and disrepair. In 1974, Herkenrode was listed as a historical monument and the surrounding landscape became a nature preserve. The Flemish government purchased the site in 1998 and began a program of restoration and development. Today it is one of a dozen Flemish Heritage sites whose preservation is linked to their importance in the history of the region. The Experience Center is located in the newly renovated stables in the west wing of the complex. In addition to the museum, the center includes a small gift shop and café, where you can enjoy Herkenrode’s own abbey-style beers. The site includes an “Inspiration Garden,” an outdoor counterpart to the the Experience Center, where visitors can learn about medicinal herbs and other plants that were historically grown at Herkenrode. The surrounding landscape is ideal for a stroll, and there are four signposted walks that start at the abbey.